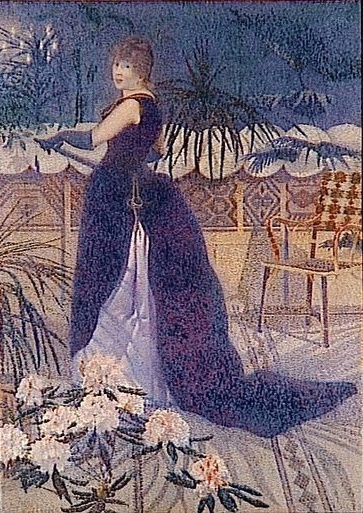 Pointillism is a technique and style of painting invented by the French painters Georges-Pierre Seurat and Paul Signac in 1886. The objective of pointillism is to create the illusion of your subject/solid space by using dots, only dots, and nothing but dots, of any pure color or size. This technique relies optics, utilizing both the art’s and the viewer’s perceptive ability of eye and mind to optically blend the color spots into a fuller range of tones. This is similar to the four-color CMYK printing process used by some color printers and large presses that place dots of Cyan (blue), Magenta (red), Yellow, and Key (black). Televisions and computer monitors use a similar technique to depict images using red, green, and blue (RGB) colors. Today artists can achieve this effect with a variety of tools, such as a pen, pencil or tiny paint brush; but the image must be rendered through the application of pure pigment with small distinctive dots (points). As you can imagine this is a very time consuming and meticulous process requiring patience and discipline. However, Seurat’s painting received a withering reception within Impressionist circles. Seurat’s innovation was a deliberate challenge to Impressionism’s first practitioners, such as Renoir and Monet. 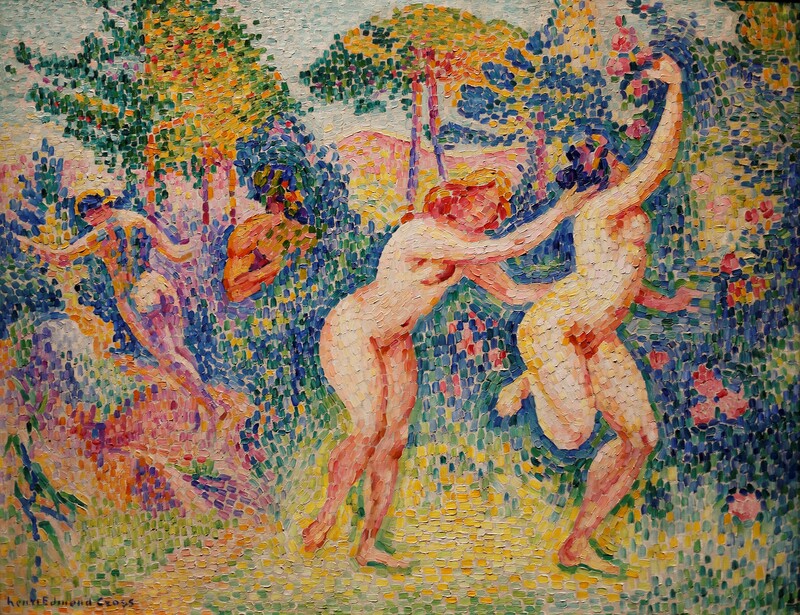 Impressionist critics and artists disliked Pointillism because the technique was a flagrant departure from traditional methods of blending pigments on a palette. 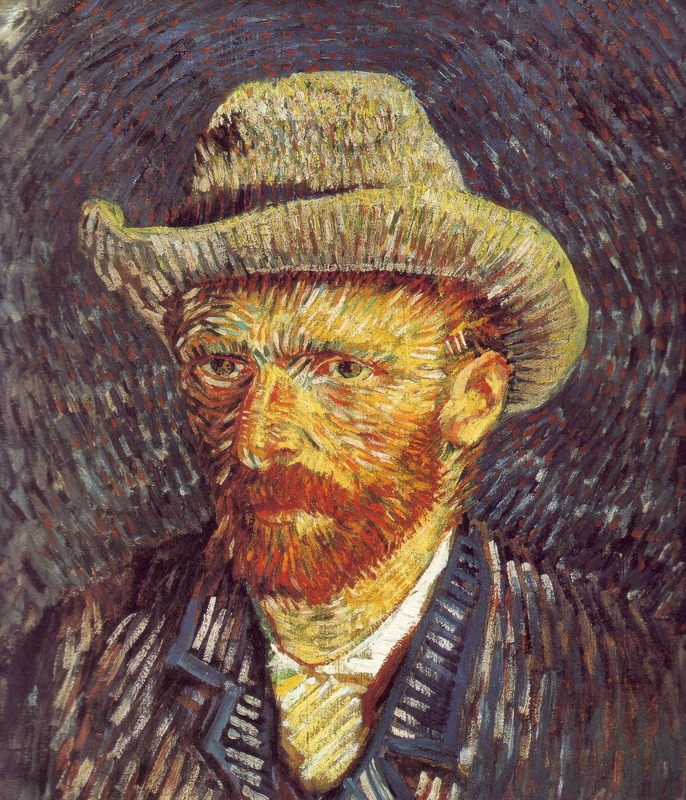 Impressionism was all about creating images with a variety of brushstrokes, and Pointillism removed brushstrokes all together thus eliminating texture and the ever venerated “hand of the artist.” Art critics even intended the name “Pointillism” to ridicule these paintings— though it no longer carries that earlier mocking connotation. 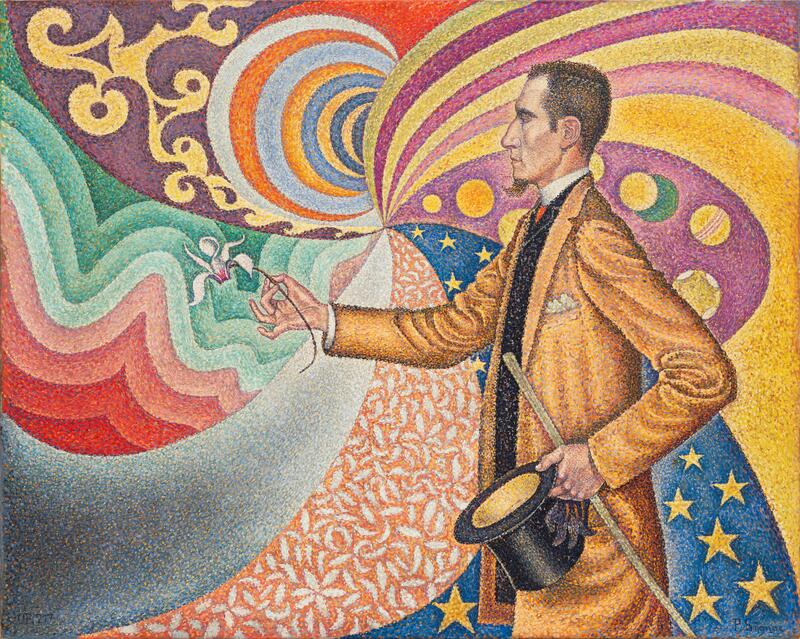 Signac became Seurat’s faithful supporter, friend, and successor by embracing Pointillism to develop his own color theory. 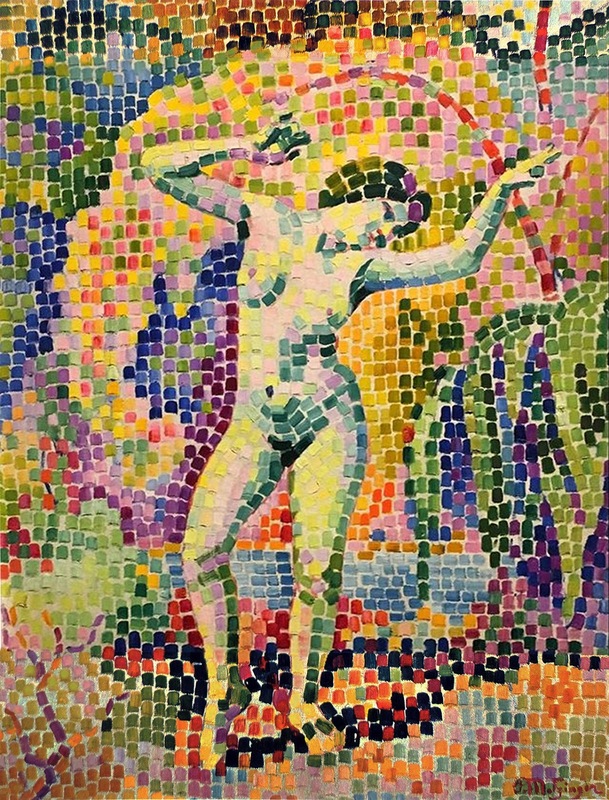 Signac’s color theory became the foundation for his more technical adaptation, Divisionism. They differ in that Pointillism is concerned about the mechanics of dot-work used to apply the paint, not necessarily the science of color separation. Divisionism is concerned specifically with the science of color separation and juxtaposition of small dots of pure color. Either way, both are concerned with the additive aspect of light and color, much like the RBG image you are staring at on your screen right now. 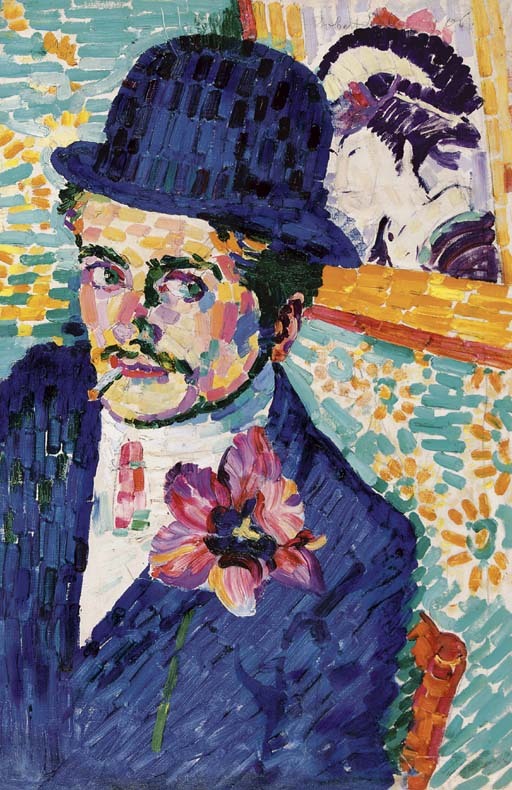 Pointillism continued to evolve through the experiments of later artists like Van Gogh, Jean Metzinger, Robert Delaunay, Warhol and to some extent in Pop Art with Roy Lichtenstein‘s exploration of print media. Oh! And of course Yayoi Katsuma, remember? The technique is still used today, and even I did a dot drawing with ink in high school. Though with pointillism, the artist sacrifices depth and texture, the variety and richness of colors achieved after much diligence is simply stunning. *Bonus: Pointillism is also a kind of music that developed in the mid to late 20th-century. Different musical notes are made in seclusion, rather than in a linear sequence, giving a sound texture similar to pointillism. This type of music is also known as punctualism or klangfarbenmelodie. Ruhrberg, Karl. 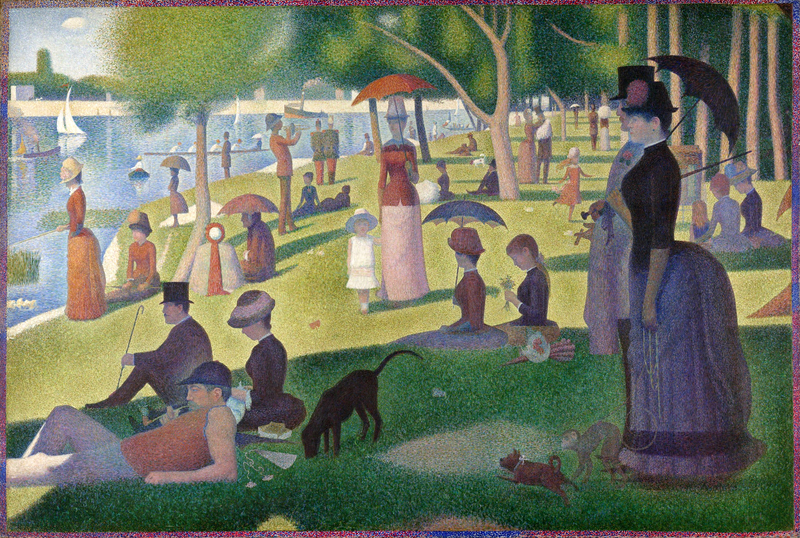 “Seurat and the Neo-Impressionists”. 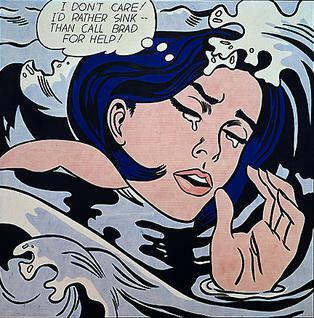 Art of the 20th Century, Vol. 2. Koln: Benedikt Taschen Verlag, 1998. ISBN 3822840890.